Fisch News: Wall Street Fraud Watchdog Warns All That Glitters May Not Be Gold - Dont buy fake gold coins. Get the Fisch. Protect your gold investment. The Wall Street Fraud Watchdog is warning US, or global investors of precious metals, or gold, and or silver coins to extremely cautious about buying precious metal bars, or coins from just anyone. The group says "There's a lot more money in counterfeiting gold, or silver coins, than selling cocaine, or heroin, and we think Chinese made precious metals knock offs have the potential of being a gigantic financial disaster for investors worldwide. A good chunk of the Chinese economy depends on counterfeiting, the Chinese do not care about who their counterfeits hurt, and we are saying buyer beware, this is a really, really big problem, and given the economic problems in China, we think the problem is about to get much worse." Do not buy precious metal bars, or precious metal coins on the Internet, or on Internet auction web sites. Only buy precious metal bars, or precious metal coins from the most reputable dealers, that have been in business for at least five years, and that have a money back guarantee on the authenticity of their precious metal products. 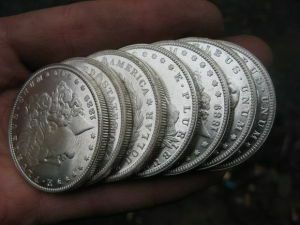 Do not buy precious metals, or gold, and or silver coins at flea markets, swap meets, or from strangers. At some point even smaller precious metals, or precious metal coin dealers, that up until now had a great reputation will start selling Chinese counterfeits because the profit potential is so great. The Wall Street Fraud Watchdog says, "Just to make the point about the profitability of Chinese counterfeit silver, or gold coins, from what we understand, you can buy a Chinese counterfeit American Eagle gold coin in China for about ten US Dollars. Take the coin back to the US, and sell it on the Internet for $1500. That's a profit of $1490. Bring in 100 of these knock offs from China & you just made a profit of $149,000 US." The Wall Street Fraud Watchdog says, "We are certain there are already victims out there, who actually think the bag of silver US Dollars, they just spent thousands for on the Internet are actually worth something. The Chinese counterfeiting coin, or precious metals disaster is going to end bad for lots of people, and we are praying people wake up, before they throw their money away for nothing. We are huge fans of all investors having a portion of their portfolio in precious metals, or coins. Please take our advice, and only deal with the most reputable of precious metal dealers, who also offer a money back guarantee on the authenticity of their products."